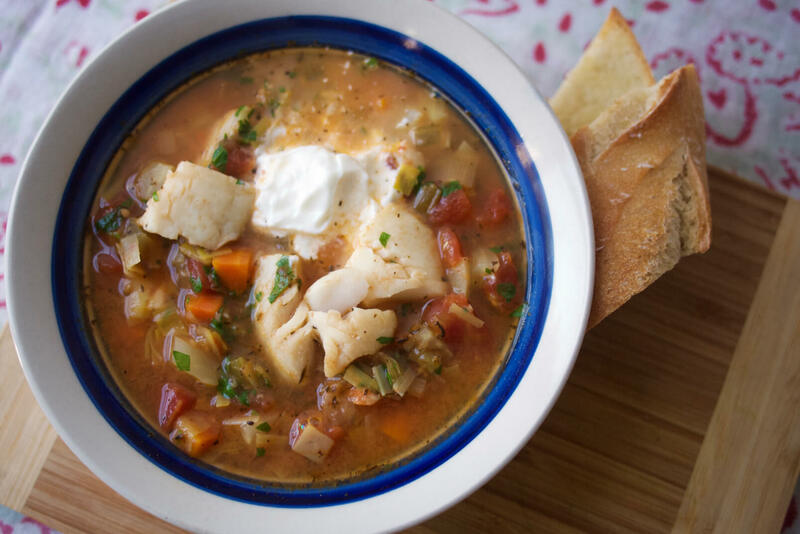 The idea of a Provençal fish stew may seem complex, but this dish is quite simple to make. There's no need to make a fish stock, or even a vegetable stock, as the base -- the anchovies, garlic, and spring vegetables make their own delicious broth as they cook with Vanns Herbes de Provence, Cayenne, Saffron, and Bay Leaves. And no need to be afraid of the anchovies here, either! They melt away into the background, leaving behind only a faint briny savoriness. The fish cooks quickly and easily in this base, and a simple garlic mayonnaise adds richness to the entire dish. Put the garlic and ¼ tsp. Kosher salt in the bowl of a mortar and pestle and pound until reduced to a paste. Add the anchovies and pound to incorporate them into a smooth garlic-anchovy paste. If you don’t have a mortar and pestle, you can use your knife to puree the garlic, as shown here by the great Jacques Pepin, and then very finely chop the anchovies. In a large pot, heat the olive oil over medium heat. When warmed, add the leeks, carrots, celery, and fennel along with a pinch of kosher salt and saute until leeks are translucent and tender, about eight minutes. Stir in the garlic and anchovies, Herbes de Provence, and cayenne and saute until fragrant, about one minute. Add the white wine and raise heat to medium-high. Simmer until wine is reduced by one third, about 5 minutes. Stir in tomatoes, water, bay leaves, saffron, and another pinch of salt. Bring to a full simmer and then lower heat to medium to maintain a gentle simmer. Cook, stirring occasionally, until liquid has reduced and tomatoes have softened, about 25 minutes. While the soup cooks, season the fish with kosher salt and pepper and make the garlic mayonnaise. To make the garlic mayonnaise, stir the mayonnaise and garlic together in a container and refrigerate until ready to serve. When tomatoes have softened and stew has reduced, add the fish to the pot and keep at a very gentle simmer, reducing heat if necessary. Cook until fish is just cooked through and flakes when you test it with a fork, 5-10 minutes, depending on the thickness of your fillets. Keep an eye on it while it cooks and test it frequently - it can go from perfect to overcooked in just a minute. When fish is done, remove the pot from heat, remove the bay leaves, and stir in the parsley. Taste for seasoning and add salt as needed. Serve with a dollop of garlic mayonnaise and some crusty bread for soaking up the stew.